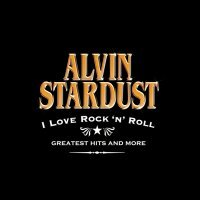 Alvin Stardust's new album, I Love Rock 'n' Roll, is available for ordering. 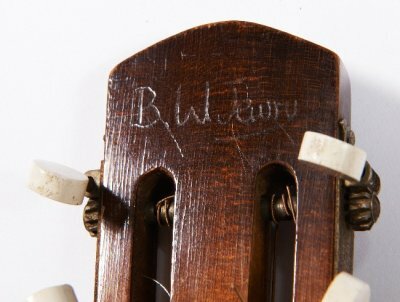 His publicity people tell me that Billy once gave him a signed guitar...although the supplied pic seems to show a signature in Alvin's own real name, "B. W. Jewry" (Bernard William Jewry). Perhaps I'm missing the point somewhere. We all probably think of Alvin first and foremost (or Shane Fenton as he then was) for his very entertaining cameo song spot in Billy's first film, Play It Cool. Shane's mother used to offer bed and breakfast in Mansfield, and often provided accommodation for artists appearing in package tours at the Granada Theatre (now, sadly, the Four Seasons Shopping Centre). It was at the Granada that I saw Del Shannon, Dion, Joe Brown and The Lad himself, among many others. Not many people know this - well, they didn't until Vince Eager published his memoirs - but Vince could have become Alvin Stardust. Vince was in digs during a tour when Hal Carter, then Billy's manager, phoned and told Vince to watch the television children's show, Five O'Clock Club. In it, a clown called Alvin Stardust sang a song called My Coo Ca Choo, and Hal asked Vince his opinion of the song. At that time, "Alvin Stardust" was being played by the song's composer, Pete Shelley, who wanted to quit, and Vince was invited to take over, keeping the character's name, but shedding the costume. Vince turned it down, and a few weeks later, saw Shane on television, giving a brilliant glam-rock performance. "It was a role I could never have pulled off," said Vince, who rates Alvin as one of the nicest, most talented guys on the scene. The CD looks like a cracker - to order, please use this link to Amazon, which will earn commission for our charity appeal without costing you an extra penny. Order it now! 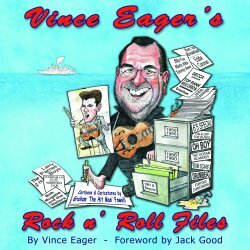 Well over 200 pages of no-holds-barred fun as Vince lifts the lid on his rock 'n' roll life. From skiffling in the 50s, to rooming with Billy Fury and fighting off the amorous advances of Larry Parnes; from wowing the world in Elvis The Musical to sailing the oceans on the plushest cruise liners. Vince has cocked a snook at African dictators, and always come up with a smile and a song. The must-read music book of the year. Copies cost �.99 + �75 p&p. Credit card orders through Paypal, paying account info@vinceeager.com, or by cheque payable to VIP, posted to Vipro House, 4 Cherry Tree Close, Radcliffe, Nottingham, NG12 2GE. Back in the 1970s, our good friend Vince Eager was much in demand to cover Elvis tracks. It's his voice that you'll hear on budget compilations, and which used to keep us entertained in supermarkets. 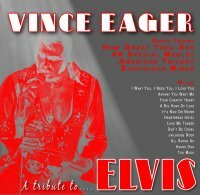 That album was a stunner, and it turned out to be one of the best moves ever Vince made, as the producers of the West End smash hit musical, Elvis, needed a new star for the show. Vince played the mature Elvis in London and around the world for five years. That original vinyl release is now on CD, together with four bonus tracks recorded live in concert a couple of years ago. The complete tracks list is: (LP) Heartbreak Hotel, Love Me Tender, Don't Be Cruel, Hound Dog, I'm All Shook Up, Jailhouse Rock, It's Now Or Never, Too Much, I Want You I Need You I Love You, Your Cheatin' Heart, Any Way You Want Me and A Big Hunk O' Love. (Live) How Great Thou Art, CBS 68 Special Medley, Suspicious Minds, American Trilogy. For ordering details, or to pay by Paypal, click here, or a cheque to me will be passed to Vince. Please make the cheque, for �, to Mr R. Taylor, and post it to me at 48 Queen Street, Balderton, Newark, NG24 3NS. Vince will donate �from every purchase to Alder Hey. - 8 August 06. When, I wonder, is the rest of the world going to discover Laura, the young lady who has been charming and entertaining us so brilliantly for the past few years? This superb new CD demonstrates a maturity and range that takes this talented teenager to a new plane of performance. There are just eight tracks, of which two have been previously released. The main point of interest for Fury fans will be the blissful version of Forget Him, which even includes a few snatches of dialogue by Billy, but Laura also hits the jackpot with the Elvis number, Don't. 65 Good Reasons? The title track marks the 65th birthday of Sir Cliff Richard with a version of Move It. 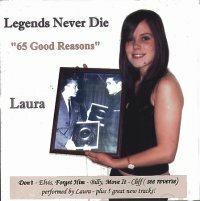 Catch Laura at the Sunnyside in March, but in the meantime, snap up this superb CD. It's �99 including post from Kevin Summerfield at 6 Blacksmith's Way, Northampton, NN7 2HY. First, listen to a sample. Two excellent new releases have come my way this month. Click the underlined tracks at the foot of the page to hear samples - Real Player needed. Groovy Tracks by Track Back is a very professional production from the band we saw in action at Fury Fest 03, and who made such a superb job of closing the first half at the Sunnyside in February. This is a 21-track stunner from vocalist Roger Sea and guitarists Doug Collins and Dave Harman. Fury fans will enjoy three standards - Halfway To Paradise, Like I've Never Been Gone and a haunting A Thousand Stars. 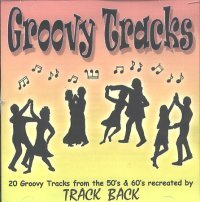 The lads also cover a great selection of other tracks from the late 50s and 60s. Impeccable guitar work, superb production and driving vocals add up to a package that brings great credit to our very good friends. 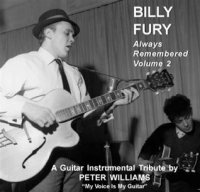 Peter Williams' second volume of instrumentals of Fury hits, Always Remembered, is a very different product. As we know from the first volume, Peter is a guitar virtuoso whose style inevitably invites comparison with Hank Marvin. These 14 tracks make superb easy listening. My advance copy soon became a favourite choice to accompany lazy evenings with a book, or a quiet meal. 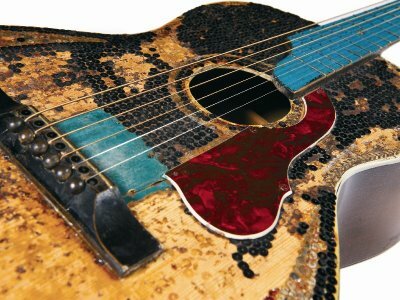 Peter's greatest talent lies in giving voice to the guitar, as he works at bringing the vocal line to life. My particular favourites are A Thousand Stars, one of two duets with Track Back's Dave Harman - a superb arrangement and Give Me Your Word. The CD is accompanied by an eight-page booklet, with the customarily erudite notes to be expected from Chris Eley, as well as a useful set of contact details for both fan clubs and the memorial fund. One to lie back and lap up! Released October 3 - to order.